The 10th annual Eastern Alameda Christmas Bird Count will be held on Friday, December 14, 2018. Please contact Jeff Miller (Jeff AT alamedacreek DOT org) if you are interested in participating. A huge thank you to Rich Cimino for initiating the Eastern Alameda bird count! The Christmas Bird Count is an annual nationwide volunteer-based bird survey effort coordinated by the Audubon Society to promote bird conservation and assess long-term trends in winter bird populations. 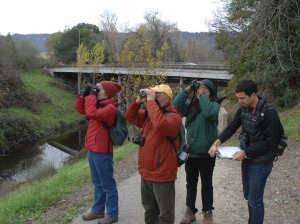 The annual Eastern Alameda County bird count was initiated in 2009. The 15 mile radius count circle is in the vicinity of the towns of Sunol, Pleasanton and Livermore, and includes five East Bay Regional Parks, significant SFPUC watershed lands, and East Bay birding hotspots such as lower Mines Road, Sunol Wilderness, and Sycamore Grove Park. Birders and volunteers with any level of experience can participate in the Christmas Bird Count. Please contact Jeff Miller (Jeff AT alamedacreek DOT org; (510) 499-9185) if you are interested in being an area count leader. 2015 results: 82 volunteers tallied 149 bird species. Notable birds were Western Tanager and Bells Sparrow; also significant 21 Rock Wrens, 8 Bald Eagles and 33 Golden Eagles. Summary of 2009-2014 bird count data for eastern Alameda County. More than 2 million individual birds counted in 6 years, of 177 different species. 2013 results: More than 90 volunteers tallied 159 bird species. Highlights included 7 bald eagles, 8 ferruginous hawks, 55 golden eagles, 3 pygmy-owls, 3 burrowing owls, 13 Lewis' woodpeckers, 24 loggerhead shrikes, 56 yellow-billed magpies and 14 phainopepla. 2012 results: 90 volunteers tallied 149 bird species. Highlights included 5 bald eagles, 4 ferruginous hawks, 24 golden eagles and 7 prairie falcons. 2011 results: nearly 90 volunteers tallied 155 bird species. Highlights inlcuded 3 bald eagles, 6 ferruginous hawks, 47 golden eagles, 4 pygmy-owls, 1 burrowing owl, 1 yellow-bellied sapsucker, 1 red-naped sapsucker, 28 loggerhead shrikes, 160 yellow-billed magpies, 13 rock wrens, 1 canyon wren, 5 phainopepla, and 11 rufous-crowned sparrows. 2010 results: 83 birders tallied 150 bird species. Highlights included 100 wood ducks, 3 bald eagles, 7 ferruginous hawks, 21 golden eagles, 2 northern saw-whet owls, 1 red-naped sapsucker, 1 Lewis' woodpecker, 29 loggerhead shrikes, 192 yellow-billed magpies, and 1 canyon wren. 2009 results: 75 volunteers tallied 144 bird species. Highlights included 2 bald eagles, 49 golden eagles, 7 northern pygmy-owls, 1 short-eared owl, 1 Lewis' woodpecker, 176 yellow-billed magpies, 1 canyon wren, 90 tri-colored blackbirds, 3 vesper sparrows, and 2 grasshopper sparrows.